Costume Check: Does Your Outfit Offend? | BANG. Home›News›BC News›Costume Check: Does Your Outfit Offend? Costume Check: Does Your Outfit Offend? This Halloween season, the Undergraduate Government of Boston College (UGBC) is encouraging students to be mindful of their costumes and the potential effects they could have on other people. The 2013 “Dress With Respect” campaign has been active since the Facebook page was created on Oct. 19. When you "like" the Facebook page, you are in turn pledging to dress with respect when you attend those wonderful get-togethers this upcoming Halloweekend. The idea is to promote conversation concerning sensitivity to the backgrounds of all students. It’s no small task, according to Natali Soto, CSMO '14, the UGBC Vice President for Diversity and Inclusion, who sees it as extremely necessary. “As a council, we felt that Halloween costumes were getting progressively more racially, ethnically and religiously offensive,” she said. Instead of sitting around twiddling their thumbs, various members of UGBC got to work enacting the Dress With Respect campaign. Now in its second year, the goal remains the same. In Soto’s words, the purpose is to “ignite conversations surrounding the issue and remind students to dress respectfully this Halloween.” There are several branches of the campaign, all aimed at fostering a feel of sensitivity when it comes to Halloween attire. The first of these is the Facebook page itself, which makes the rest of the Dress With Respect events accessible to all students via the wonder that is social media. 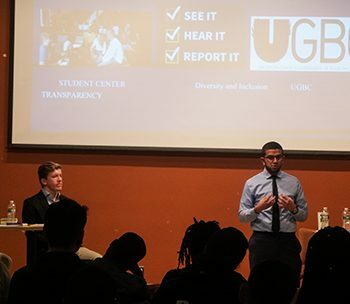 On the page, you can find photos of student leaders on campus who have taken action and pledged to dress with respect, including UGBC President, Matt Nacier. Other leaders that have pledged include, but are not limited to, those of FACES, Word of Mouth, Bystander Intervention, GLC, Chorale and, naturally, The Gavel. Be on the lookout for these images on the Facebook page, as well as on fliers and a banner around campus. The second branch of the campaign is a costume contest, which will be held via the Facebook page as well. Anyone can participate, with the loose guidelines that submissions be creative and non-offensive to any individual or culture. Prizes for first, second and third place will be awarded $100, $75 and $50 gift cards to the bookstore respectively. You can enter the contest by posting your picture to Facebook and tagging @DressWithRespect2013. Hurry, though, because prize places are based on “likes” and the deadline for submission is Nov. 2. Please know better than Julianne Hough...black face is never acceptable. Third are the proxy stations that have been set up around campus for the past few days and will be there in the days leading up to Halloween. At these stations, pictures of popular Halloween costumes are displayed. Under each image, people are to mark “yes,” “no” or “not sure” in response to whether or not they’re offended by the costume pictured. “The purpose [of the proxy stations] is to get a dialogue started and have students realize that while they might not find some of the costumes to be offensive, many of their peers may have answered yes for some of the costumes,” said Soto. The goal is to show people how others around them may perceive certain costumes. The next stations will be in O’Neill Plaza from 12-2 p.m. on Wednesday, Oct. 30 and Thursday, Oct. 31. Also located at the stations are stickers and buttons with the campaign logo, which serve to spread the word even more. This year’s Dress With Respect campaign is especially important because last year’s garnered national attention and became part of an increased dialogue of sensitivity to social identifiers in Halloween dress. This year, “other schools are reaching out to use our logo and ideas,” Soto explains. Clearly, Soto, her fellow committee members and UGBC must be doing something right if other institutions are taking a look at their student body and realizing that they should respond to this previously overlooked issue. Click here to “like” the Dress With Respect campaign on Facebook and take the pledge. Remember to have lots of wholesome fun this weekend and dress with respect in the process! Images via Dress with Respect 2013/Facebook.